President says writer "may not be a Republican, it may not be a conservative, it may be a deep state person." 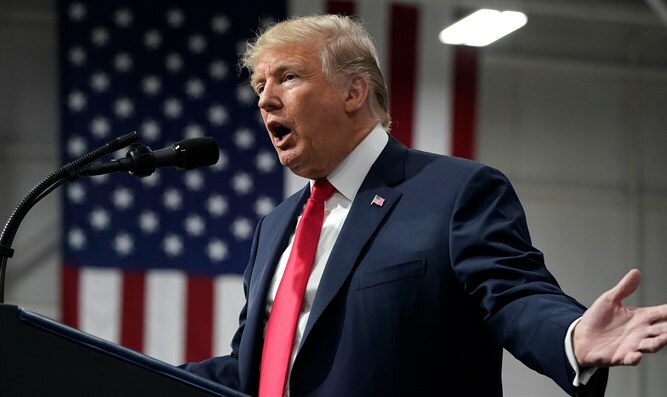 President Donald Trump said Friday that the New York Times' anonymous op-ed trashing him was "virtually" an act of treason. In an interview with Fox and Friends, Trump said that the Times "should have never have done that because really what they’ve done is, virtually, you know it’s treason." He speculated that the person behind the article is situated "at a fairly low level." He told interviewer Peter Hegseth: "I heard you say yesterday, we have thousands of people that in theory could qualify. So they take one person out of thousands, but what’s unfair – I don’t mind when they write a book and they make lies cause it gets discredited. We just discredited the last one, we discredit all of them because it’s lies. But I'll tell you, when somebody writes and you can’t discredit because you have no idea who they are – usually you’ll find out, it’s a background that was bad, it may not be a Republican, it may not be a conservative, it may be a deep state person that’s been there a long time. You don’t know where – it’s a very unfair thing. But its very unfair to our country and to the millions of people that voted,really for us. They voted for us."